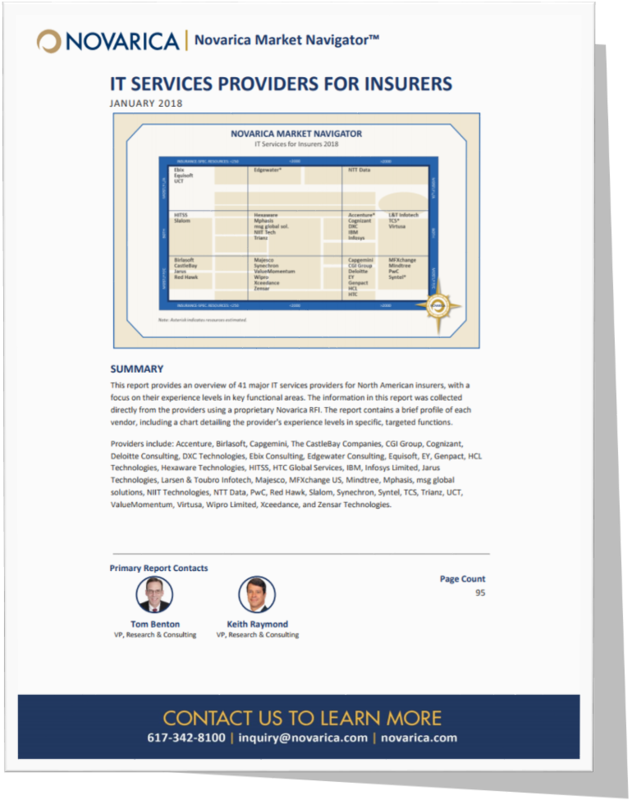 In the recently published 'Novarica Market NavigatorTM: IT Services Providers for Insurers' report, Novarica profiled ValueMomentum, Inc. as one of the 41 major IT services providers for North American insurers. The report focuses on provider's experience levels in key functional areas. This is an authorized excerpt of the report that includes a profile of ValueMomentum, Inc., a brief coverage of its IT services offerings and key differentiators, i.e. deep insurance expertise, its focus on developing tailored solutions and its focus on execution. The report also includes a chart detailing ValueMomentum's insurance resources, current ADM and Non-ADM clients in the North American region & clients by area. The capabilities that IT services providers offer to overcome challenges faced by insurance IT organizations. Factors to consider when selecting an IT services partner. ValueMomentum's IT services offerings for North American insurers and the key service differentiators along with its market position, client base, and areas of service.